Large kanji Dictionary of lettering and symbols. Expressed by general font the words of the Japanese Kanji and Hiragana.鼻 penmanship. Design of large letter symbols. 鼻 japanese 「鼻」It is a representation of the Mincho and Gothic typefaces in a single kanji. It will be ideas and materials, such as T-shirts and illustration design. 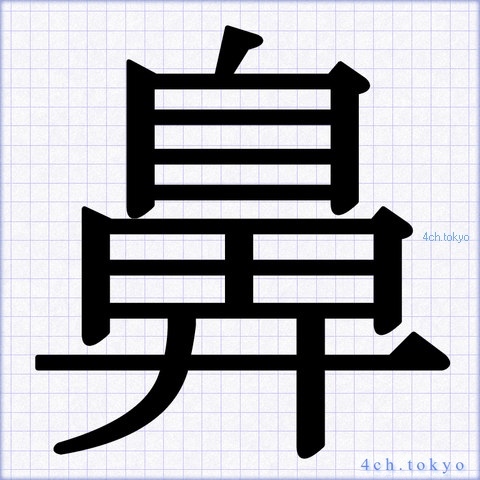 「鼻」You can find an excellent Japanese words to design. I'm sorry. How to write and how to read and meaning do not do commentary. It can not be used in the re-distribution and business illustrations. I wore a grid pattern so that the balance of the letter can be seen. Character of the design to be displayed in Japan of books and the personal computer. It will change the impression when you edit the color of the text and background, such as Photoshop. 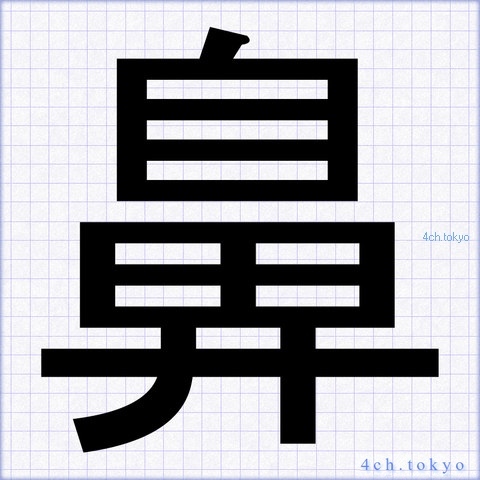 Help to sample and study of Japanese kanji design. Your ideas will be abundant. Impact will change when you edit the color of the text and background in photoshop.You can understand the comparison of designs of Mincho and Gothic symbols. It is seen to display the Kanji symbols to entire screen properly as well in the smartphone and tablet. There is no explanation of the letter of the meaning and how to write because it is Materials of japanaese kanji character. You can check massively in the list of most of the Japanese kanji like a dictionary. 「鼻」　Also The Search a lot of Japanese words to other. There is also a case where there is a mistake since created a web site manually. There is a need to re-check the Japanese dictionary just to be safe. I will not be responsible in the web site use. Reprinting or re-distribution, can not be commercial use. Copyright (C) 4ch.tokyo . All Rights Reserved.